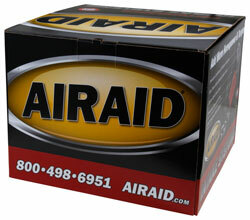 The AIRAID 251-253C fits some Cadillac CTS-V models. See vehicle applications for details. The AIRAID Cold Air Dam (CAD) Air Intake is engineered to give your engine larger amounts of cooler air to produce more horsepower and torque. For a sleek look under the hood the intake tube and heatshield have been given a faux carbon fiber appearance . The intake system retains the original location of the air filter and the heatshield uses the factory mounts for installation. This CAD system utilizes a low-restriction intake tube which have mounting locations for the factory MAF sensor and PCV. The 360-degree conical AIRAID premium air filter is washable and reusable, less restrictive than traditional paper and has outstanding filtration. It also features a red dry synthetic medium which does not require oiling and is recommended for everyday street driving. Some AIRAID air intakes are not legal for sale or use in California and other states adopting California emission standards, while others are 50 state legal. View the product's vehicle applications to determine the legal status for each vehicle. I love this product. The shipping was fast, and the product proved to be every bit as good as described. I'll be using AIRAID my future needs.